Psoriasis can be a tricky condition to treat. I tackle this condition from the inside out, using a multi-pronged approach. Yes, it’s important to treat the skin topically, but it’s equally important to treat the digestive, immune and nervous systems to address the underlying causes. The skin is one of the largest organs for eliminating wastes, so this is where underlying imbalances in your body may present. If your liver, kidneys and bowels (other major organs of waste elimination) are not functioning effectively, your skin may be the place where unwanted toxins accumulate, which can contribute to the development of psoriasis. It’s important to take a good look at your diet and make appropriate changes if necessary. This may include removing wheat and dairy for a period of time. Wheat and dairy are the two most common foods that your body can react to in a negative way, often causing problems in your small intestines and leading to inflammation in the skin. Naturopaths believe there is a strong link between the health of your gut and how the rest of your body functions. Between 70-80% of the bodies immune cells reside in the gut including T helper cells. If unhealthy bacteria and damage to the lining of the gut occurs due to specific common antigens like wheat and dairy or alcohol and drugs, an autoimmune reaction may occur leading to the development of psoriasis. Although it is not proven how T cells are activated in psoriasis, it is known that specific T cells ( which normally protect the body against infection) can migrate to the surface of the skin, stimulating keratinocytes and trigger the release of inflammatory markers, which can lead to hyperproliferation and inflammation of skin cells. The body tissues are attacked by its own immune system, this is why it is seen as an autoimmune response. It is also not uncommon for psoriasis sufferers to have other autoimmune disturbances such as thyroid problems, vitiligo and alopecia. Increasing good amounts of fruit and vegetables in your diet and essential fatty acids found in deep sea fish like salmon, tuna and sardines is important to help reduce inflammation. It’s also important to reduce proinflammmatory foods such as red meat, saturated fats, alcohol, sugar and other refined foods. Acidic foods such as coffee, oranges, and tomatoes should also be limited. Drinking lots of water also helps with eliminating unwanted wastes. I personally formulate an herbal medicine liquid mix to support the liver, skin and nervous systems. It may include herbs such as Rehmannia, Licorice, Sarsaparilla, Schisandra and St Mary’s Thistle. Prescribing nutritional supplements is often necessary such as probiotics, vitamins A, D, C and E, zinc and selenium. Together they work on improving the integrity, structure and healing of the skin and digestive system. They also improve immune function in general and in the gut. It is however important to take the correct therapeutic doses and to consult a qualified naturopath. I also use a specially formulated skin cream that has high amounts of Vitamin D and herbs created by a leading naturopathic company, to apply on a daily basis. I wanted to give a brief overview of the pathophysiology of psoriasis and my next blog entry will include the key points in addressing psoriasis naturopathically. Psoriasis is a chronic, relapsing, thickened proliferative skin disorder due to hyperproliferation, altered differentiation and inflammation (McCance & Huether, 1998). It can occur at any age, usually in your 20’s (McCance & Huether, 1998). The cause is unknown although genetics, immunologic and biochemical alterations have been explored (McCance & Huether, 1998). The skin shedding time is decreased from 30 days to 3-4 days not allowing for cell maturation and keratinisation to occur which results in thick silvery plaques that are well demarcated (McCance & Huether, 1998). It is commonly found on the face, scalp, elbows and knees (McCance & Huether, 1998). 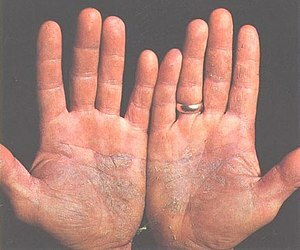 Guttate psoriasis suddenly appears on trunk and extremities and may appear after a streptococcal respiratory infection (McCance & Huether, 1998). Between 10 to 16% of psoriasis patients react to gluten a protein predominantly found in wheat, barley, rye and oats and may respond to a gluten-free diet (Osiecki, 2001). I hope this was of some help to those suffering from psoriasis, keep posted for next weeks up date on addressing this condition with more in depth naturopathic advice. Last week I spoke about some of the factors than can impact on psoriasis such as stress, diet and poor elimination of toxins. I also briefly spoke about the pathophysiology of psoriasis and a general naturopathic approach to address some of the issues. Today I’ll talk in more detail about important naturopathic steps needed to be taken to treat some of the underlying factors of psoriasis, and appropriate nutritional and herbal treatments. I think it’s also important to explain how these treatments address specific problems with the condition. It may help to read the pathophysiology section of last week’s blog just to re-cap on some of the main points. Cyclic AMP are cell messengers that increase cell maturation and decrease cell replication, so it’s important to try to increase these numbers to prevent a high turn over of skin that results in psoriasis and psoriatic plaques. Cyclic GMP are also a cell messengers but increases cell proliferation adding to the problem of plaque formation, so it’s important to decrease levels of cyclic GMP to reduce cell proliferation (Murray & Pizzorno, 2003). Decreased levels of cyclic AMP can be due to incomplete protein digestion, breakdown and poor absorption (Murray & Pizzorno, 2003). Vitamin A, and Golden Seal (a herb) can help correct imbalance as can improving digestive function (Pizzorno & Murray, 2003). Toxins produced in the gut such as Candida albicans (which is a fungal infection) can increase cyclic GMP (Pizzorno and Murray, 2003). Diet should be rich in fruits and vegetables to bind bowel toxins. Check for gluten sensitivity (Osiecki, 2001). Smilax ornata is a very good herb to bind and excrete bacterial endotoxins (Pizzorno & Murray, 2003). Smilax improved psoriasis in over 50% of patients treated in open, uncontrolled trials (Bone, 2003). The liver increases elimination of toxins made in the body and generally aids detoxification (Pizzorno & Murray, 2003). Eliminate alcohol from diet – alcohol increases absorption of toxins from gut, and impairs liver function and depletes nutrients (Pizzorno & Murray, 2003; Osiecki, 2001). Silybum marianum a wonderful liver herb – improves liver function, inhibits inflammation, and decreases excessive cellular proliferation (Pizzorno & Murray, 2003). A disordered immune response resulting in T helper 1 cell dominance in the gut is a major sustaining cause in the hyperproliferation and inflammation of psoriasis. Certain strains of Probiotics and Vitamin D are important to try to balance and regulate T helper cells in the gastro intestinal system. Serum free fatty acid levels are typically abnormal in psoriasis patients (Pizzorno & and Murray, 2003) Their skin lesions also have higher arachidonic acid than in normal skin (Osiecki 2001). Fish oils rich in EPA and DHA (equivalent to 150g of salmon, mackerel or herring) greatly improves the condition because it competes for arachidonic- acid binding sites (which are inflammatory), inhibiting inflammation (Pizzorno and Murray, 2003). According to Osiecki (2001) stress, anxiety and depression or personal problems can exacerbate or precipitate psoriasis in 23-42% of patients. Herbs such as St John’s Wort, Vervaine, Withania and Rehmannia are some important herbs to support the nervous system and adrenal glands. Leads to inhibition of cell proliferation and is extremely beneficial for psoriasis (Pizzorno & Murray, 2003). Vitamin E – to help normalise glutathione levels, can also be added to topical creams (Pizzorno and Murray, 2003). It also prevents free radical damage to the Poly Unsaturated Fatty Acids within cell membranes (Braun & Cohen, 2005) and modulates the conversion of Arachidonic Acid to inflammatory eicosonoids (Osiecki, 2001). Zinc – plays a critical role in skin health (Pizzorno and Murray, 2003). Selenium – to improve glutathione levels (Pizzorno and Murray, 2003). Vitamin D – helps to regulate cellular growth and differentiation in various tissues (Braun & Cohen, 2005). Aloe Vera – in a double blind placebo controlled study found topical aloe vera extract .5% in a hydrophilic cream had cured 83.3% of patients compared with the placebo cure rate of 6.6% (Braun & Cohen, 2005; Bone, 2003). Glycyrrhetinic acid – component of licorice similar effects to hydrocortisone in the treatment of psoriasis (Pizzorno & Murray, 2003), also Braun and Cohen (2005) believe it to have beneficial anti-inflammatory actions. Exposure to sun – early morning and late afternoon exposure of affected area to the sun for 15 -20 minutes may also help with Vitamin D in take and healing. Swimming in the sea – may also be beneficial. Once again I hope this was useful information for people suffering from psoriasis and if you have any questions or would like a consultation to help with your condition don’t hesitate to contact me. This entry was posted in Health Blog and tagged Dietary Advice for Psoriasis, Herbs and Vitamins for Psoriasis, Natural Therapies for Psoriasis, On Line Health Consultations, Psoriasis, Skin Conditions, Skin disorder on October 24, 2012 by 66mo.